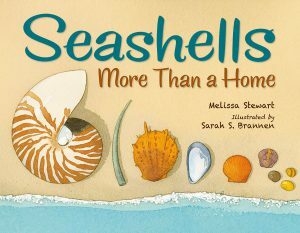 SEASHELLS: MORE THAN A HOME by Melissa Stewart is a detailed and informative picture book appropriate for reading aloud and for children who enjoy learning about nature and science on their own. As the title suggests, the pages share the myriad ways seashells serve the creatures that live within them. With two sets of text, one version in larger print and another with more detail in smaller print, this is a book that will grow and continue to entertain over time. Children will marvel at the travel, strength, protection, and usefulness different seashells provide. The illustrations, by Sarah S. Brannen, are creative accompaniments to the text, and they often use comparisons to other animals to highlight the abilities of seashells. Portrayals of various sea creatures like scallops, oysters, and more show action and emotion artistically without anthropomorphizing in a cartoonish manner. The main text of the book is followed by an explanation of different kinds of seashells, as well as an author’s note and an illustrator’s note. We are confident that Seashells: More Than a Home will be a beloved addition to any bookshelf or collection. Highly recommended. BAMBINO AND MR. TWAIN by P.I. Maltbie is beautiful picture book about a journey through the grieving process, helped along by a sympathetic cat. It uses language and scenes that younger readers will find accessible and even relatable. With gorgeous collage-influenced pictures by Daniel Miyares, the moody, rich tones of the beginning of the story slowly give way to the brighter colors of spring and finding motivation to heal from grief. Aimed at ages 5-8, we believe Bambino and Mr. Twain could work for slightly older readers as well. More text-heavy than many early elementary picture books, this story of a cat’s companionship, and the sudden loss thereof, will appeal to children who have a special stuffed animal or house-pet. 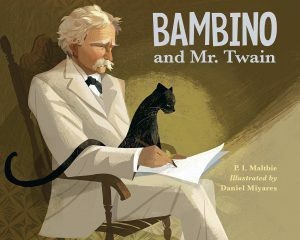 All through a sad winter following the death of Samuel Clemens’ wife Livy, the family cat Bambino sits with him and mourns with him. And it is a sudden departure on Bambino’s part that prompts an end to Clemens’ self-imposed exile from society. Lovers of literary trivia will enjoy the storyline as it explains how Samuel Clemens began wearing white suits as well as anecdotal background on his daughters and home life. The author’s note at the end of the book reiterates the storyline in condensed form and provides additional detail about Clemens’ relationship, both working and personal, with his wife. Overall, Bambino and Mr. Twain is a lovely picture book that addresses the difficult topic of loss and mourning without falling into morbidity or a saccharin approach that condescends to the reader. Highly recommended. 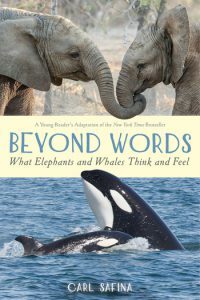 BEYOND WORDS: What Elephants and Whales Think and Feel is new adaptation of Carl Safina’s 2015 bestselling book is aimed at younger readers, ages 10-14. The first half is devoted to the Lives of Elephants, and the second to Killer Whales, or Orcas. Thankfully, the adaptation doesn’t oversimplify the descriptions or the topics, and the volume (the first of two) maintains the balance of deep research and loving observation. The first part of the book, Lives of Elephants, includes topics like family, play, grief, and communication. Using dialogue and a journalistic style of pondering questions and then answering them based on observation will appeal to young readers and reluctant readers. While not image-heavy, the photos includes are wonderful and emphasize elephant generations and the people who work to help them. Part two, Killer Whales, includes sections of the social lives of Orcas as well as singing and sonar, as well as the effects of captivity on the animals. The section “Defying Explanation” is especially interesting, and it is sure to prompt conversation amongst readers. As with the first section, while there are not many photos, they are well-chosen and suit the text. Beyond Words is readable, informational, and interesting volume is highly recommended for children interested in animals in the wild. The conversational and journal entry style also lends itself well to reading aloud, which is a wonderful way for families to connect over a shared interest. 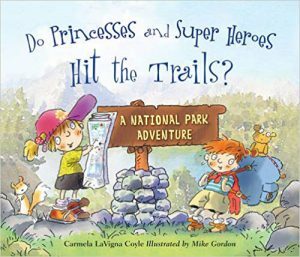 This fun, rhyming picture book takes this adventurous princess and her super hero companion to twelve National Parks around the USA. Part of the Do Princesses…? picture book series, DO PRINCESSES AND SUPER HEROES HIT THE TRAILS? by Carmela LaVigna Coyle highlights some of the most recognizable and iconic parts of National Parks like Denali, Acadia, Yellowstone, Zion, and more. Aimed for children ages 4-8, the book makes a solid preparation for a family vacation or for an introduction to the concept of National Parks. In June, this picture book comes out as a board book — perfect for traveling! The simple, sometimes silly, rhymes will be fun for families to read aloud, and children learning to read will find them fun to decipher and repeat. Some words are emphasized, just as an enthusiastic child might, making read alouds even more appropriate. “Let’s take THIS trail and begin to explore.” The illustrations are joyful and colorful, and kids will want to “find” the teddy bear that accompanies the children on each page. Parents concerned about the gender stereotypes in using “princess” for the girl and “super hero” for the boy can rest assured that each of the siblings exhibits both a zest for adventure and a sense of wonder throughout the book. See our review of Do Princesses Wear Hiking Boots? here.